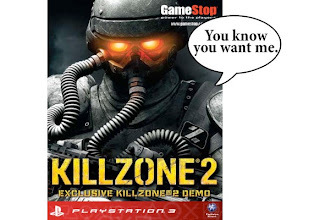 It looks like players won't have to wait until after Killzone 2 rolls onto store shelves to get their first taste of combat. A Sony Europe rep has revealed that a demo for the anticipated shooter will be available on the European PSN on February 5. It will be available on the US PSN at the same time, but only to those partaking in GameStop's pre-order deal. It appears the uncommitted will have to wait for a general PSN release on Feb. 26 -- or attempt subversion via a European account. "I can confirm that this will be live on the PSN store on Thursday 5th February (same day as SCEA) across all SCEE PSN locales," wrote Sony Computer Entertainment UK Limited's Hugo Bustillos in an email. According to Bustillos, the demo will consist of the first two areas of 'Corinth River,' the game's first level, described as 'beach landing' and 'warehouse.' A tutorial will be included as well, ensuring that all ISA greenhorns will be up to speed when the full game arrives for the PS3 on February 27.